ALTUS, Okla._Altus firefighters are gearing up to compete against the quickest crews in the world at the Scott Firefighter Combat World Challenge, and they hope to come away victorious for a second time. The competition is this week in Alabama. Competitors perform a series of five events, from a high-rise climb to victim rescue. 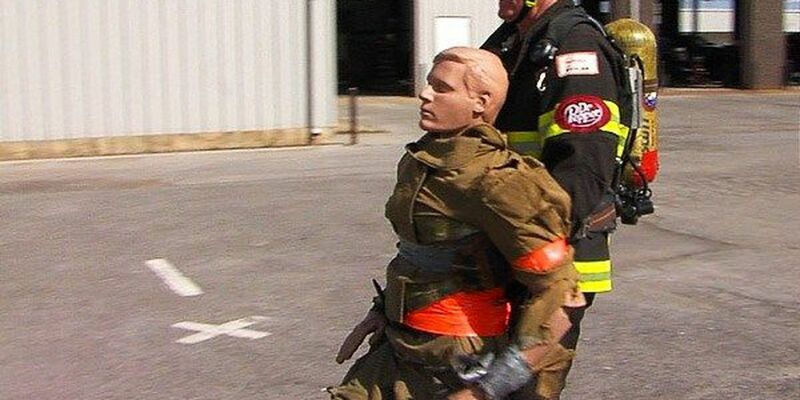 All the events use techniques that firefighters use in emergency situations. The Altus team is hoping for a medal, but they are expecting at least a race without any penalties, which come from mistakes. This team has competed for four world championships, and won once in 2004. For the older members, they say they aren't the fastest, but use precision to compete. Assistant Fire Chief Jimmy Rogers competes in the over-50 division and has been competing in the challenge since the group's inception in 1998, with one thought remaining constant. "I wasn't what I would call in athlete in high school, but each one of us do our parts and we do it well," Assistant Chief Rogers said. Because of that, the team has won multiple championships, but Assistant Chief Rogers knows that the possibility of mistakes are always there, like when he tripped during a U.S. national event. "I wasn't strong to the finish. I wasn't pulling hard, and I tripped and fell. It cost us the race. Even doing it as long as we've done it, we still make mistakes," he explained. Tommy Sadler, a retired firefighter with 37 years of experience, has been competing with Team Dr. Pepper since the second year. He uses it as a way to stay healthy away from his farm. "I wasn't in the best of shape when we started, but as we kept competing…I kept working out," Sadler said. He now owns the over-65 tandem world record time, which he broke during the first weekend of this month at the U.S. nationals. "Now we have a record that everyone can shoot at now," Sadler said. He says that moment and the 2004 championship are the highlights of his career, but he wouldn't mind another before he calls it a day. "Maybe one more year, but this might be my last year. I will have to re-evaluate next year and see how I feel, but that would be the way to go out. That would be awesome," Sadler said. No matter the result, they use these events to build lifelong friendships with other firemen across the globe. For Assistant Chief Rogers, it's also about showing that a department of 32 firefighters, like Altus, can compete with those, like Toronto, who have 2,000. "That makes you feel good, because sometimes you wonder if these guys know who you are, but when we started hearing them say, 'dang. Team Dr. Pepper is here,' that's when we know we arrived," Assistant Chief Rogers said. Team Dr. Pepper will leave Tuesday morning. They have runs on Wednesday and Thursday, and bracket-play on Saturday. You can watch a live stream of the events here. The team has a lengthy group of sponsors, including Dr. Pepper, which help pay the team's expenses.